Today, during an interview with Van Jones on CNN, Congresswoman Tulsi Gabbard announced that she will run for president in 2020. This means that a surfer, in a very real way, can change the world. We first met Congresswoman Tulsi Gabbard in December of 2017 during our annual pilgrimage to the North Shore. While John John Florence was threading needles at Pipe en route to his second world title, we coordinated a meeting with the Congresswoman at her home on the other side of the island. We were intrigued by Gabbard’s rare mix of political ambition, commitment to the environment, and surf sensibility. After a wide-ranging conversation in her backyard, (where her very first surfboard still lives) we got pizza and shave ice at the local farmer’s market. Gabbard is a lifelong surfer and advocate for our oceans. She’s a veteran who served two tours in the Middle East. She was the first Hindu member of Congress and the youngest person elected to Hawaii State Legislature, taking office when she was 21 years old in 2002. The prospect of a surfer bringing aloha and an unwavering commitment to the environment to the nation’s highest office is an exciting one. 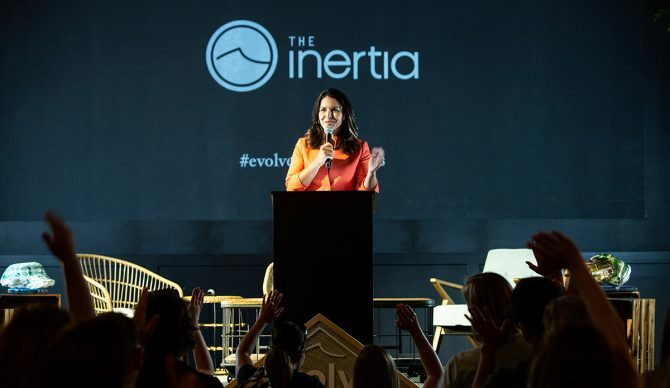 Watch Gabbard’s full keynote speech at EVOLVE 2018 below.